Today in Masonic history Fess Elisha Parker, Jr. passes away in 2010. Fess Elisha Parker, Jr. was an American actor. Parker was born on August 16th, 1924 in Fort Worth Texas. He enlisted in the United States Navy during the late part of World War II. He was hoping to become a pilot. Parker was 6 feet and 6 inches which caused the navy to turn him down as pilot. He would go on to try to be a radioman gunner, and again his height would prevent him from gaining that duty. He would transfer to the United States Marines and would be sent to the South Pacific shortly before the end of the war. After being discharged from the Navy in 1946, Parker would use his G.I. Bill to first attend Hardin-Simmons University. While attending the University he would be involved in a car accident, the other driver would stab Parker in the neck. After the accident, 1947, he would transfer to the University of Texas as a history major. He would also become active in drama. He would graduate from the University of Texas in 1950. He would have one year left on his G.I. Bill and would attend the University of Southern California where he studied for a Master's Degree in theatre history. In the summer of 1951, Parker would begin his acting career. He would first appear as an extra in the play Mister Roberts. He would go on to work with Warner Brothers Studios for a time, appearing in various roles until 1954. In 1954 he would appear in the science fiction movie Them!, it was about giant insects. His role was small, he played a pilot that was locked up in an asylum when no one would believe him that his plane was brought down by a giant insect. The star of the film was James Arness, who would go on to appear in the show Gunsmoke. At the same time that Them! was appearing in theaters, Walt Disney Studios was looking for someone to play the lead in a three episode television show, now called a mini-series, about Davy Crockett. James Arness was the primary candidate for the role until they saw Parker in his role in Them!. Parker played a character who was convinced of what he saw no matter what the authorities had to say. This level of conviction was just what the studio wanted for the role of Davy Crockett. After the Davy Crockett series, Parker would become very dissatisfied with the roles that Disney was offering him. The studio wanted to type cast him in roles similar to the Davy Crockett character to protect the brand they had established with Parker. He would leave Disney and make a variety of movies and television shows. 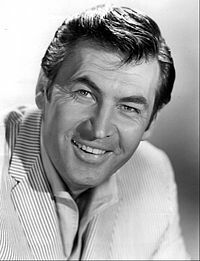 In 1964, Parker would begin working on the show Daniel Boone, another frontiersman. The series would run from 1964 to 1970. It was one of the highest rated shows of it's time. Several of it's most popular episodes were directed by Parker himself. In 1974, at the age of 49, Parker retired from acting. He would open up a Winery at his Vineyards in Los Olivos, California. The winery can be seen, under another name, in the move Sideways. Parker himself is not in the film. Parker would pass away from natural causes on March 18th, 2010. Parker was a member of Mount Olive Lodge No. 506 in Los Angeles, California.